Are you prepared for any disaster or medical emergency? Even if you're not a paramedic, you should know how to care for yourself and your loved ones when medical aid isn't readily available. 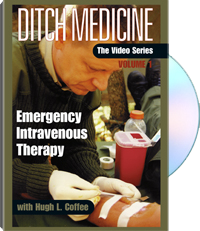 In Ditch Medicine: The Video Series, best-selling author and emergency medicine expert Hugh Coffee gives you the detailed, step-by-step instruction you need to save lives in a crisis. In Volume 1, Coffee explains in easy-to-understand, layman's terms the critical role that intravenous (IV) therapy plays in emergency medicine and teaches you every detail of selecting, administering and troubleshooting IVs. Through graphic demonstrations on live patients, he teaches you all the basics of IV therapy as well as lesser-known emergency procedures such as the insertion and use of gastronasal tubes and IV administration through venous cutdown. Until you're prepared for ditch medicine, you're not prepared. For academic study only. Hugh Coffee is a professional paramedic with extensive experience administering emergency medicine in Third World and battlefield environments. His many specialities include improvising medical equipment from available materials and performing disaster-medicine procedures under primitive conditions.